Mission Hills resort at Haikou, Hainan, China has received the top award at the Asia Pacific Golf Summit in Brunei. The pre-eminence of Mission Hills’ Haikou resort was confirmed at last week’s Asia Pacific Golf Summit in Brunei. The 10-course complex, which includes Asia’s largest mineral springs and spa facility, was named Best Golf Resort in Asia Pacific, while its signature Blackstone course took out the top award for Best Championship Course in the region and Best Course in China. 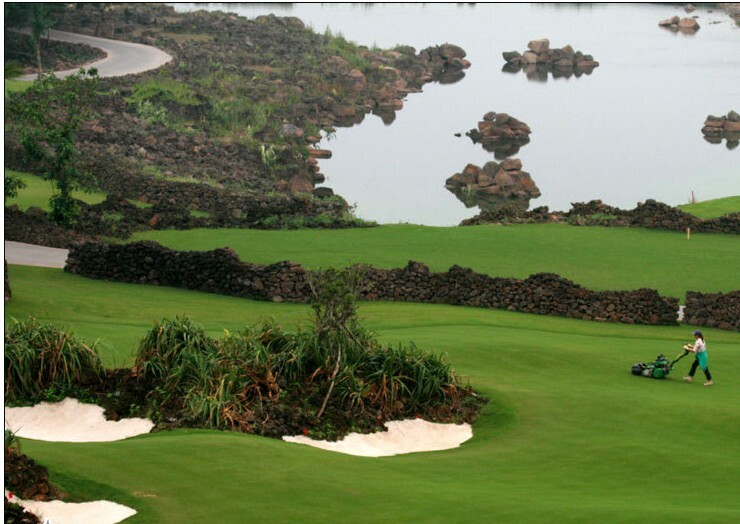 Together, the 10 courses at Mission Hills Haikou is the largest collection of lava-based golf courses in the world. The Blackstone course is home of the biennial World Cup, scheduled to be played again in November 2013, and the World Celebrity Pro-Am tournament, also held biennially, held last October. Since opening in 2010, Mission Hills Haikou has become one of the premier tourism attractions on China’s southern tropical island of Hainan. A current development program – comprising Renaissance, Ritz-Carlton and Hard Rock hotels, a Lan Kwai Fong entertainment and restaurant district, Feng Xiaogang movie theme town, 300 boutique shops, ice-skating and tenpin bowling centres – will make it one of China’s major tourism facilities when completed in late 2014. Mission Hills chairman, Dr Ken Chu, has predicted the complex will welcome more than 15 million spenders a year when completed. Meanwhile, a fantasy golf course being built at Mission Hills Haikou will replace one of the existing 10 courses and provide an added attraction for golfers and newcomers to golf to visit the resort. Other accolades for Mission Hills at the Asia Pacific Golf Summit were the naming of Dr Ken Chu and his brother Tenniel Chu as Golf Personalities of the Year for Asia and Schmidt-Curley Design as Best Golf Course Architect in Asia Pacific. Schmidt Curley designed all 10 courses at Haikou and worked closely with leading golf personalities in designing the 12 courses at Mission Hills’ headquarters near Shenzhen in Guangdong province.